Ian Helfant, associate professor of Russian and Eurasian studies and environmental studies, transfers honey bees from a nucleus box to a hive at the Colgate Community Garden in May. Photo by Mark DiOrio. Colgate’s newest housing accommodations are now home to about 60,000 new residents — honey bees, to be exact. A collaboration between the university’s food service provider, Chartwells, and a group of students looking to support the local honey bee population led to the installation of two hives in a newly established apiary in the Colgate Community Garden last month. The new endeavor also resulted in the creation of a student beekeeping club. “In the beginning of the fall semester, I thought it would be a good idea to bring an apiary to Colgate, but it would only work if we had enough students to take care of it,” said Isabel Dove ’19, a geology major from Collegeville, Pa. who is an intern in the Colgate Office of Sustainability and club president. Even though Dove has no previous beekeeping experience, she wanted to do her part in supporting the local honey bee population in light of the difficulties bees have been having with colony collapse disorder nationwide. “The beekeeping club, which now has 30 members, will be responsible for the maintenance of the hive, and the club will also be responsible for harvesting the honey,” Dove said. 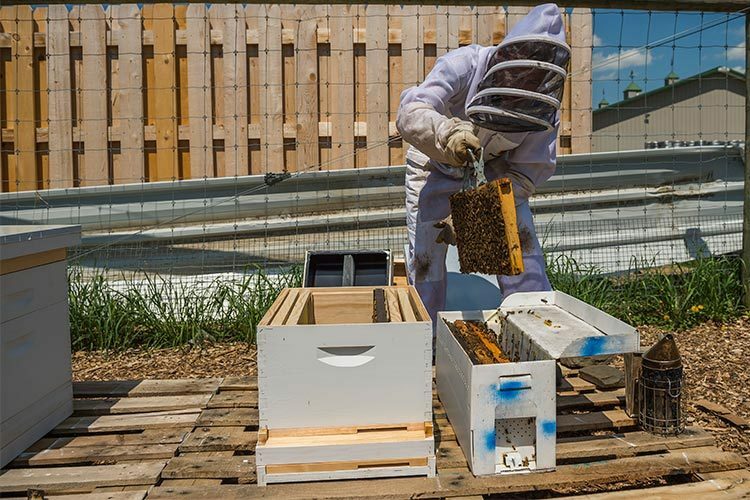 During the summer, club advisor Ian Helfant, associate professor of Russian and Eurasian studies and environmental studies, will help care for the newly established hives. Such maintenance is nothing new for Helfant, who operates 10 bee hives of his own. Depending on environmental conditions, each hive has the potential to produce about 40 lbs of honey each year, and club members plan to sell the results of the bees’ labor on campus. The club is also planning educational outreach events to bring in local community members to learn more about the bees and their role in the environment. “I think having an apiary on campus is an excellent opportunity for students to research pollinators and pollination,” said Pamela Gramlich, program coordinator for the Office of Sustainability and the Environmental Studies Program.